TORRANCE, Calif.– Kubota Tractor Corporation announces the latest version of its popular RTV900 workhorse utility vehicle model, the new and improved RTV900XT. Building on the strengths of Kubota’s diesel-powered RTV900, this model’s key new feature is the exclusive Variable Hydro Transmission (VHT) Plus2, boasting higher torque to maximize towing and hauling performance, along with smooth dynamic-braking and easier shifting, making the Kubota RTV900XT ideal for the toughest residential and professional jobs. “The Kubota RTV900XT marks an important evolutionary step for our popular RTV900 line. We successfully entered and grew the utility vehicle market in 2004 with the original RTV900 and its unique diesel engine and hydraulic transmission combination; and we are continually looking for ways to bring additional value and satisfaction to this platform. The RTV900XT delivers on that goal with tangible improvements to quality, durability, and overall worksite performance,” says Dan Muramoto, Utility Vehicle Product Manager for Kubota. 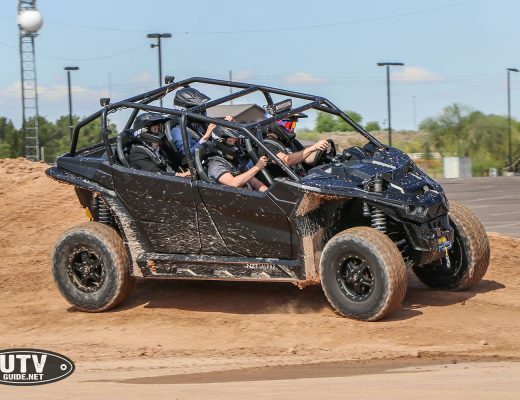 “From homeowners to contractors, we have always recognized that utility vehicle owners are a diverse group, and the introduction of this enhanced workhorse model furthers our goal to satisfy the varying needs of our RTV owners,” he adds. The RTV900XT runs on a powerful 21.6 gross horsepower, three-cylinder, liquid-cooled Kubota diesel engine, that is performance-matched to the exclusive Kubota VHT Plus2 hydrostatic transmission. This combination provides the power and torque to easily handle the toughest jobs over the long run. With an extra-large steel cargo bed and an optional hydraulic bed-lift system, the RTV900XT makes hauling and dumping easy with the simple operation of a single lever. 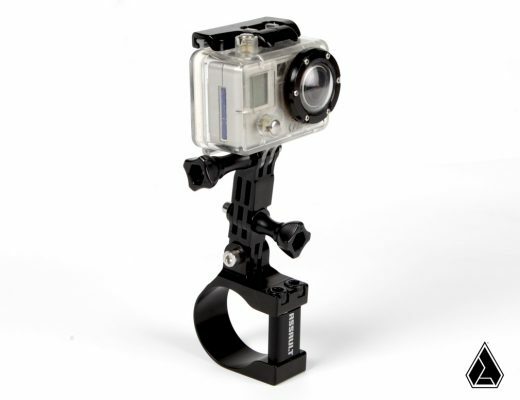 The front of the machine features a new reinforced gunmetal gray steel front guard for extra protection and durability. The responsive hydrostatic power steering makes for exceptional comfort, control and maneuverability, and a new seat design provides increased comfort for the operator and passenger. Kubota RTV500 –Kubota’s RTV500 is a 15.8-horsepower utility vehicle that fits into the bed of a full-sized pickup truck – making it perfect for everything from hunting and camping to everyday work around the jobsite. 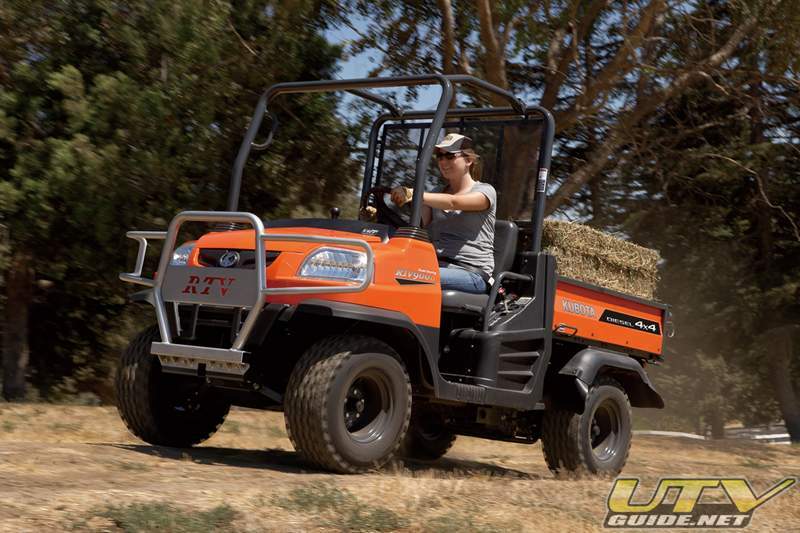 The RTV500 is Kubota’s first gas-powered utility vehicle. New! Kubota RTV900XT – The Kubota RTV900XT is built on the same trusted RTV900 platform and features an exclusive Variable Hydro Transmission (VHT) Plus2 for high torque and maximum hauling and towing capabilities. Kubota RTV1100 – The RTV1100 offers the industry’s first and only, air-conditioned factory-installed cab as standard equipment for all-weather protection and comfort. New in 2010, Kubota now equips all RTV1100 models with sliding glass windows in the doors. Kubota RTV1140CPX – The RTV1140CPX features an innovative new transformation system that quickly converts from one- to two- row seating options. This feature allows the operator to choose between additional passenger capacity and spacious 18.4 cubic-ft. cargo space, depending on the task at hand. Each model in the Kubota RTV series is designed to ensure operator comfort and safety. The durable bench seats are roomy and comfortable, the dash layout is simple and intuitive, and the flat floor provides unobstructed legroom. Regardless of model, operators can ride assured that the integrated roll-over protective structure is designed for optimal safety while meeting OSHA and SAE rollover protection standards. Kubota Tractor Corporation, Torrance, Calif., is the U.S. marketer and distributor of Kubota-engineered and manufactured equipment, including a complete line of tractors up to 118 PTO hp, performance-matched implements, compact and utility-class construction equipment, consumer lawn and garden equipment, commercial turf products and utility vehicles. For product literature or dealer locations, contact Kubota Tractor Corporation at 3401 Del Amo Blvd., Torrance, CA 90503, (888) 4-KUBOTA [(888) 458-2682], Ext. 900, or visit www.kubota.com.